The United Nations estimates for water usage per crop are stated below on plants for which data is available. 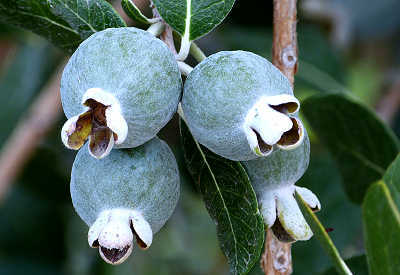 See Fruit Selection and Cultivation Tips for more information. = Top 10 best tasting fruits of the world when harvested fully ripe (selected varieties only). Fruit tree. Moderate drought tolerance. Estimated water use: 98 gallons per pound of fruit harvested. Hot dry climate suitability (some cultivars) = extra water. A columnar cactus with edible fruit. Hot dry climate suitability = protect tips from freezing, part shade in first year. Fruit tree. Drought tolerant. Estimated water use: 154 gallons per pound of fruit harvested. Hot dry climate suitability (some cultivars) = afternoon shade, extra water. Fruiting herb. Not drought tolerant. Estimated water use: 94 gallons per pound of bananas harvested, 192 gallons per pound of plantains harvested. Hot dry climate suitability (some cultivars) = extra water, extra shade, wind protection, extensive winter protection to ensure fruiting. Fruit tree. Moderate drought tolerance. Hot dry climate suitability = protect from freezes. A fruiting cane thicket. Drought tolerant. Estimated water use: 45 gallons per pound of fruit harvested. Hot dry climate suitability (some cultivars) = may need part shade, roots need thick mulch as heat shield. Tree with edible seedpods. Drought tolerant. Estimated water use: 668 gallons per pound of dried fruit harvested. Hot dry climate suitability = excellent. Estimated water use: 61 gallons per pound of fruit harvested. Hot dry climate suitability (some cultivars) = sunscald protection. Drought tolerant. Hot dry climate suitability (some cultivars) = afternoon shade, sunscald protection. Estimated water use: 77 gallons per pound of fruit harvested. Hot dry climate suitability (some cultivars) = sunscald protection. More cold hardy than most citrus. Estimated water use: 90 gallons per pound of fruit harvested. Hot dry climate suitability (some cultivars) = sunscald protection. Estimated water use: 67 gallons per pound of fruit harvested. Hot dry climate suitability (some cultivars) = sunscald protection. A fruiting palm. Drought tolerant. Estimated water use: 273 gallons per pound of fruit harvested. Hot dry climate suitability = extra water when fruiting. A fruiting shrub or small tree. Drought tolerant. Hot dry climate suitability (most cultivars) = extra water to carry fruit and retain leaves. A tree where green figs contain flowers and ripe figs are fruit. Drought tolerant with loss of crop. Estimated water use: 94 gallons per pound of fresh fruit harvested. Hot dry climate suitability = extra water in hottest months. A fruiting herb. Hot dry climate suitability = protection from frost, all day 50% shade, extra water. A vine with clustered fruit. Drought tolerant. Estimated water use: 73 gallons per pound of fruit harvested. Hot dry climate suitability (some cultivars) = excellent. Bean pod tree with tasty filling. Hot dry climate suitability = protect from freezing temperatures. Fruit tree or shrub. Estimated water use: 216 gallons per pound of fruit harvested. Hot dry climate suitability (some cultivars) = protection from frost, afternoon shade, extra water. Tropical fruit tree. Hot dry climate suitability = protection from frost, part shade in high temperatures, extra water. Fruiting palm tree. Drought and heat tolerant. Hot dry climate suitability = excellent. Fruit tree. Drought and heat tolerant. Hot dry climate suitability (most cultivars) = excellent. Fruit tree. Not drought tolerant in high temperatures. Hot dry climate suitability = extra water, afternoon shade. Fruit tree. Hot dry climate suitability = extra water when fruiting. Fruit tree. Drought tolerant. Estimated water use: 216 gallons per pound of fruit harvested. Hot dry climate suitability = protection from freezing, afternoon shade, extra water. A tree with edible seedpods, leaves and flowers. Drought tolerant. Hot dry climate suitability = protect from freezes; seedlings are transplant intolerant. Fruit, shade or ornamental tree. Somewhat drought tolerant. Hot dry climate suitability (some cultivars) = extra water when fruiting. A fruiting shrub, small tree or groundcover. Drought tolerant. Hot dry climate suitability = proper location. A highly ornamental fruit tree. Drought tolerant. Estimated water use: 361 gallons per pound of fruit harvested. Hot dry climate suitability = excellent. A single-stemmed, giant herb, taking the form of a palm tree as it grows. Not drought tolerant. Estimated water use: 55 gallons per pound of fruit harvested. Hot dry climate suitability = protect from freezes, water according to temperature. A vine with large, elaborate flowers and fruit. Not drought tolerant. Hot dry climate suitability (some cultivars) = frequent water, afternoon shade. Fruit tree. Moderate drought tolerance. Estimated water use: 109 gallons per pound of fruit harvested. Hot dry climate suitability = extra water. Fruit tree. Drought tolerant. Estimated water use: 110 gallons per pound of fruit harvested. Hot dry climate suitability (some cultivars) = extra water. A fruiting herb. Drought tolerant. Estimated water use: 45 gallons per pound of fresh fruit harvested. Hot dry climate suitability (some cultivars) = raised garden bed, consistent water schedule. An evergreen shrub or small tree with exotic edible flowers and fruit. Loses appearance at high temperatures without afternoon shade and extra water. Hot dry climate suitability = afternoon shade, extra water. A tropical, evergreen shrub with ribbed, yellow fruit. Hot dry climate suitability = protect from freezes when young, extra water. Fruit tree. Drought tolerant. Estimated water use: 260 gallons per pound of fruit harvested. Hot dry climate suitability (some cultivars) = extra water. Fruit shrub or tree. Drought tolerant. Hot dry climate suitability (some cultivars) = excellent. A tree with apple-like, aromatic fruit. Moderate drought tolerance. Hot dry climate suitability = proper location. Fruit shrub. Partly drought tolerant. Hot dry climate suitability = protect from freezes when young, slightly acidic soil. A fruiting herb. No drought tolerance without loss of crop. Estimated water use: 41.5 gallons per pound of fruit harvested. Hot dry climate suitability = plant in early fall, all day part shade, daily water, proper soil and enclosure. Tropical fruit tree. Hot dry climate suitability = protect from freezes when young, extra water. Tropical bean pod tree with edible pulp. Hot dry climate suitability = protect from freezing, proper water. A fruiting herb. Some cultivars have moderate drought tolerance. Estimated water use: 26 gallons per pound of fruit harvested. Hot dry climate suitability (some cultivars) = consistent water schedule, 50% shade all day, proper soil, raised garden bed. Fruit tree. Drought tolerant. Hot dry climate suitability = proper location, branch breakage in strong winds. Fruit tree. Drought tolerant. Estimated water use: 237 gallons per pound of fruit harvested. Hot dry climate suitability (some cultivars) = proper soil and mulch, regular water, proper microclimate, extra shade, special care first three years. A fruiting shrub. Not drought tolerant. Estimated water use: 101 gallons per pound of fruit harvested. Hot dry climate suitability = grow in container with acidic soil, daily water, afternoon shade. Fruit tree. Not drought tolerant. Hot dry climate suitability = extra water, slightly acidic soil, saline sensitive, does poorly in a container, difficult to establish below 4000' elevation. Fruit tree. Not drought tolerant at high temperatures. Hot dry climate suitability = protect from freezing, high temperatures and drying wind, provide all day part shade in hot months. Tropical fruit tree. Drought tolerant with loss of fruit. Hot dry climate suitability = enriched soil, full shade, basin irrigation. Fruit tree. Drought tolerant with proper rootstock. Estimated water use: 192 gallons per pound of fruit harvested. Hot dry climate suitability = flowers and fruits poorly in USDA zone 9 and above. A fruiting cactus vine. Drought tolerant. Hot dry climate suitability = protect from freezing and high temperatures, continuously moist soil while fruiting, part shade most of day in hot months. A fruiting shrub. Not drought tolerant at high temperatures. Hot dry climate suitability = fruits poorly in high temperatures. Tropical bean pod tree with edible filling. Hot dry climate suitability = all day part shade and extra water in high temperatures, protect from freezing when young. A vine with fuzzy brown fruit. Not drought tolerant. Estimated water use: 62 gallons per pound of fruit harvested. Hot dry climate suitability = all day part shade, frequent irrigation. A tree with red, rough-skinned fruit. Not drought tolerant at high temperatures. Hot dry climate suitability = afternoon shade, all day shade in hottest months, extra water, saline sensitive. Fruit tree. Not drought tolerant at high temperatures. Hot dry climate suitability = afternoon shade, extra water. A cane thicket with berries. Not drought tolerant. Estimated water use: 49 gallons per pound of fruit harvested. Hot dry climate suitability = fruits poorly without sufficient winter chill hours. Tropical fruit tree. Drought tolerant. Hot dry climate suitability = protect from freezes when young, all day part shade, extra water. Tropical fruit tree. Not drought tolerant. Hot dry climate suitability = protect from freezes, all day part shade, extra water.